What a beautiful display these clever people have created for their home. I love the cactus!!! Inspired by the very popular movie, Frozen, all the lights dance to the main song 'Let it Go'. I still haven't seen this movie but definitely will one day... even if just to see this Olaf the Snowman that all the kids talk about! 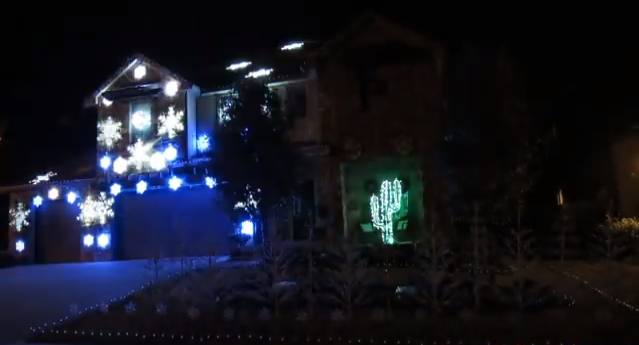 "This ultra green light display only costs $6 in electricity to run for the entire season... The cactus has been part of our display before there was a display. My wife and I found it alongside the road and fell in love with it (plus we live in Texas so we can get away with it)." This display of smaller trees at the front are gorgeous!